Wollongong Art Gallery's John Monteleone with Between the Escarpment and the Sea. Picture: Sylvia Liber, Illawarra Mercury, 1 February 2015..
Colin Lanceley (1938-2015) was one of Australia's pre-eminent Modern artists. Born in New Zealand in 1938, his family moved to New South Wales the following year. His father served as an RAAF (Royal Australian Air Force) engineer during the war years 1939-45. Colin grew up in Sydney and went to East Sydney Art College between 1954-60. After leaving school and working for a number of years - including a period as a paint mixer - he developed his professional art practice as one of three members of the Annandale Imitation Realists group between 1961-4. Colin Lanceley, Imitation Realists * Formerly Annandale, The Arty Wild Oat, National Art School, Sydney, 1961. Their mix of abstraction and the utilisation of everyday objects for sculptural additions brought the group to the attention of fellow artists and critics such as Robert Hughes. After winning the Helena Rubenstein Travelling Scholarship in 1964, Colin and his young family moved to Europe. They remained out of Australia for the next 18 years, not returning until 1981. 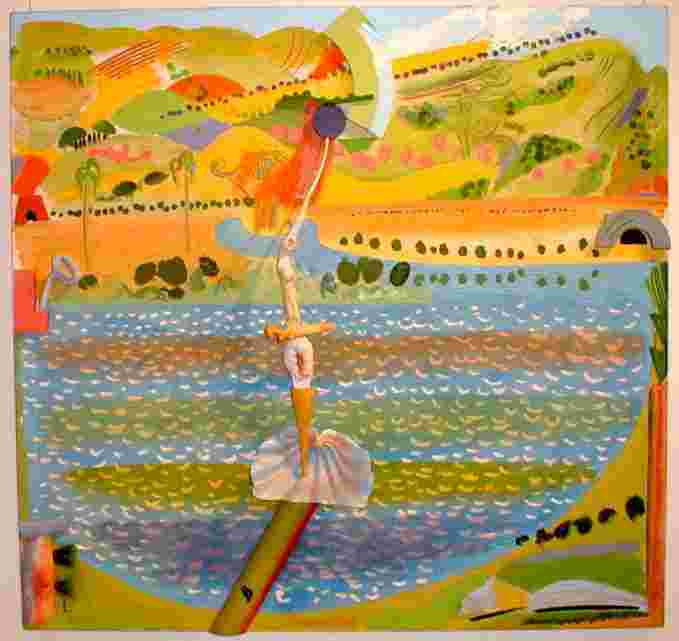 During this period Lanceley worked and taught in the United Kingdom and on the continent, building a successful professional career with the support of London's influential Marlborough Gallery. Colin Lanceley Exhibition, Marlborough Art Gallery, London, 1965. Upon returning to Australia, between 1983-6 Lanceley took up a teaching position at the City Art Institute, Sydney. He then quit to concentrate on painting, working out of his Centennial Park studio and later at a converted Surrey Hills warehouse. Around this time he also undertook studio work in his coastal holiday house at Wombara, north of Wollongong, and later further south near Werri Lagoon, Gerringong. It was here that Lloyd Rees had lived, sketched and painted from the 1940s through to the 1980s. 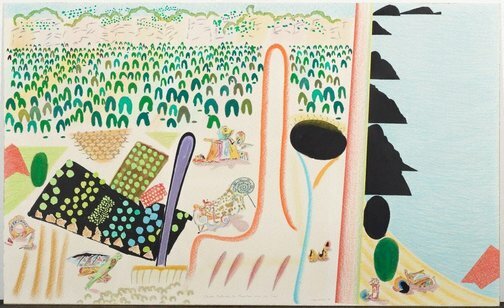 The Rees painting Road to Berry 1947 was an extremely influential work on young Australian artists such as Lanceley and Brett Whiteley. 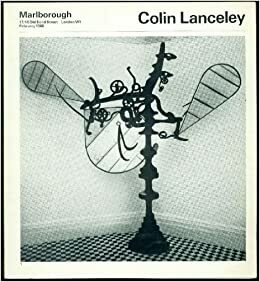 During 1987, around the time that Lanceley first began working in the Illawarra, Craftsman House published the book Colin Lanceley (revised and updated in 1993). The following year the ABC produced a documentary entitled Colin Lanceley - The Poetry of Place, featuring an interview at his Wombara residence. 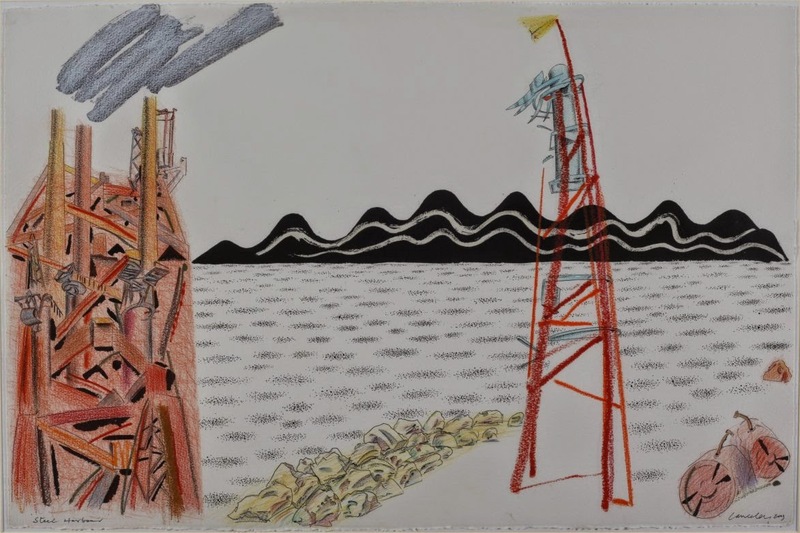 Whilst Lanceley's early work was primarily abstract and sculpture, from the 1970s he concentrated on landscapes with integrated sculptural elements. 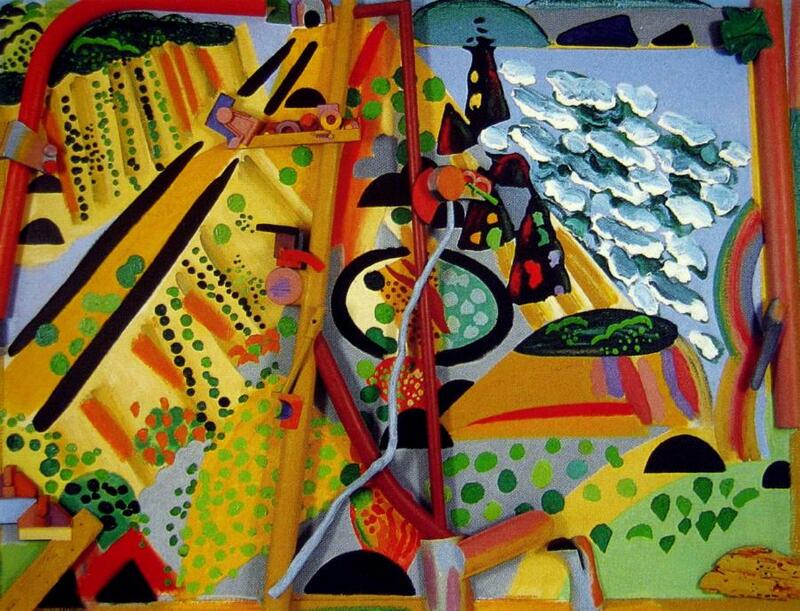 This followed an encounter with renown French artist Jean Miro who told him he was "on the right track." 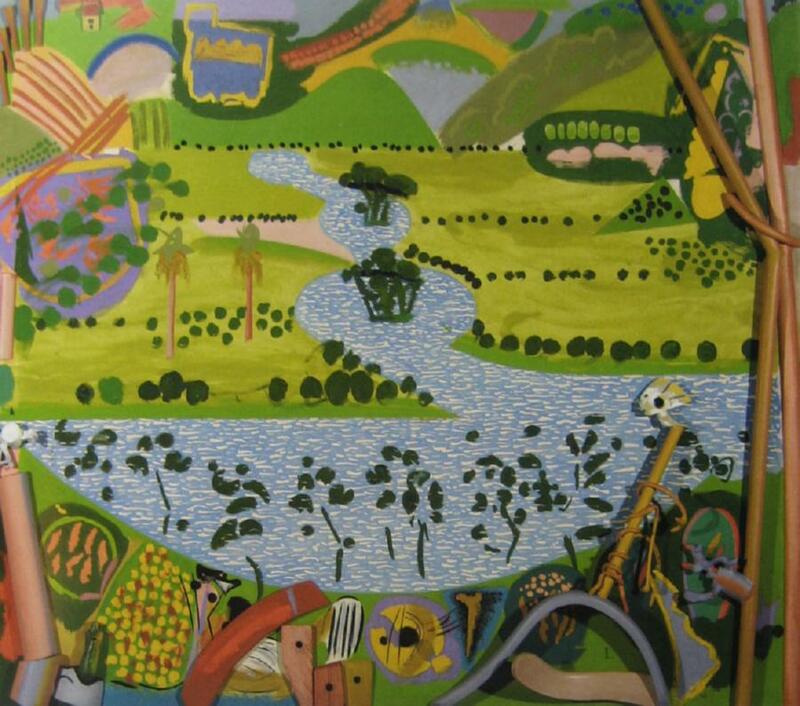 At the end of the 1980s these works - sometimes referred to as relief paintings - began to feature Illawarra themes. 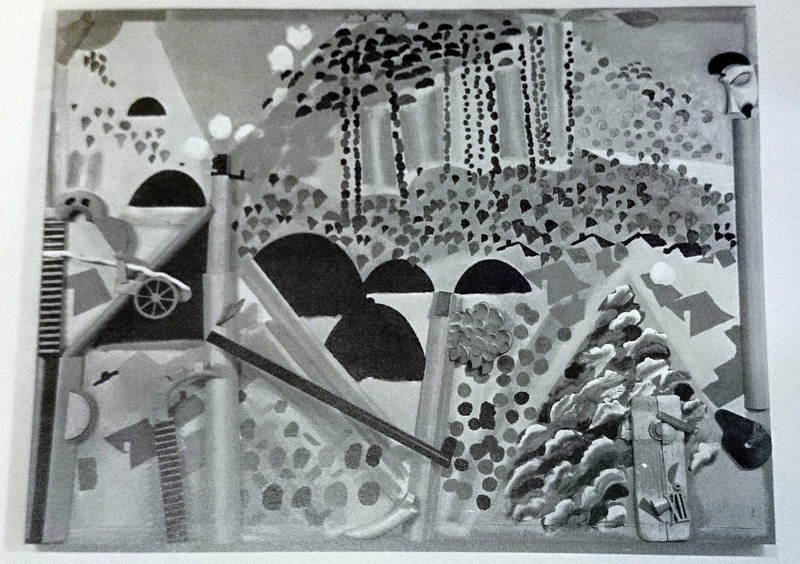 Though he also produced a number of related lithographic prints and preliminary sketches, Lanceley's most complete South Coast works are large, 3-dimensional collages of paint and wood on canvas. They present a complexity of content underlain by the juxtaposed landscape: mountain verses the sea; or mountain verses the sky, or the sky and sea with earth; or humanity and nature. Wombara - the location of the Lanceley holiday house - is very much "on the edge" geographically, with the land about there transforming seamlessless from the steep, vertical escarpment towards cliff-backed beaches. This was a feature of the northern Illawarra landscape which especially attracted Lanceley. In The Poetry of Place he makes specific reference to his encounter with "the edge" i.e. the point at which the mountain makes contact with the ocean, and the steep intervening slope upon which huminty resides. His South Coast works also make specific reference to the English author D.H. Lawrence, who visited thenearby town of Thirroul in 1922 and wrote the novel Kangaroo there. In journeying south from Sydney, Lawrence caught the steam train and described the landscape at he exited the long tunnel and the ocean near Wombarra was revealed to him as the train travelled along the edge of the mountainous escarpment. Lanceley followed on the earlier work by fellow Sydney artists Brett Whiteley and Garry Shead on this theme of D.H. Lawrence at Thirroul. 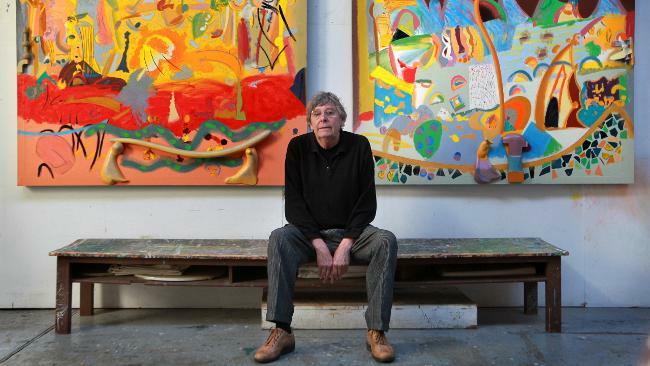 Artist Colin Lanceley with some of his works at the Surry Hills studio in Sydney. Picture: Alan Pryke Source: The Australian, 17 July 2010. 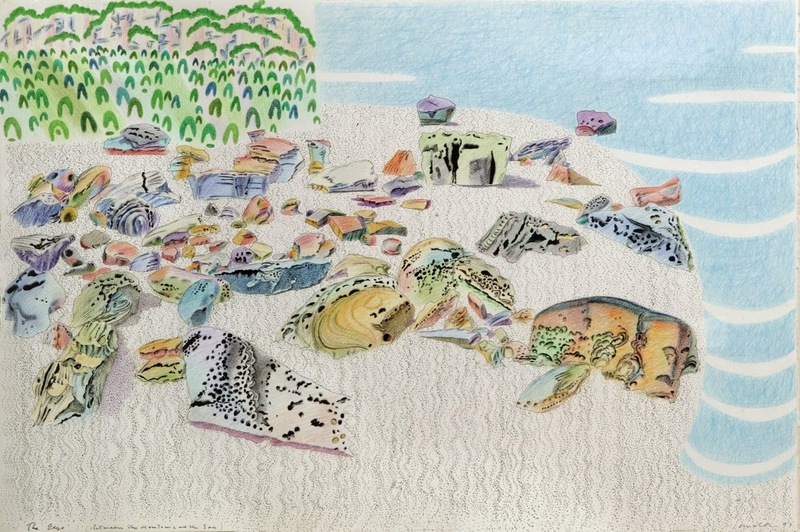 Two pictures in his studio, soon to be bound for America, sprang from experiences outside his two front doorsteps - one inner city, the other his relaxed New South Wales south coast beach house. ... Between the Mountains and the Sea [South Coast] us a collage of his feelings about that area: the sea and cliffs he sees from his front verandah, and the landscape rising behind his house, from his beloved vegetable patch and garden tools to the bushy escarpment curtaining the horizon. The miner's cottages cling precariously to the cliffs, with their backs to the most spectacular views of the sea, their fronts huddled together facing the other cottages across the street. This precarious clinging, unaware of the beauty of the Australian countryside, reminds me of the shallow-rooted sense of culture we have here. A sense we are on the edge of the great mystery, but not taking a deeply committed part in it. My pictures try to produce a deep-rooted sense of belonging to this land, in the hope that things you identify with strongly and love, you will not destroy. ... [When I was in England] I was very excited about the relationship between art and nature, how one informs the other, and the metaphors lying in the landscape, the power of place. I wanted to find the power of place in Australia. That's why I like the south coast industrial landscape so much, it has patterns and punctuation marks etched in the land: railway lines, mine shaft entrances, black piles of coal, rolled hay bales sitting in the fields. I like the way humans stamp their culture on the world, like patterns in nature. 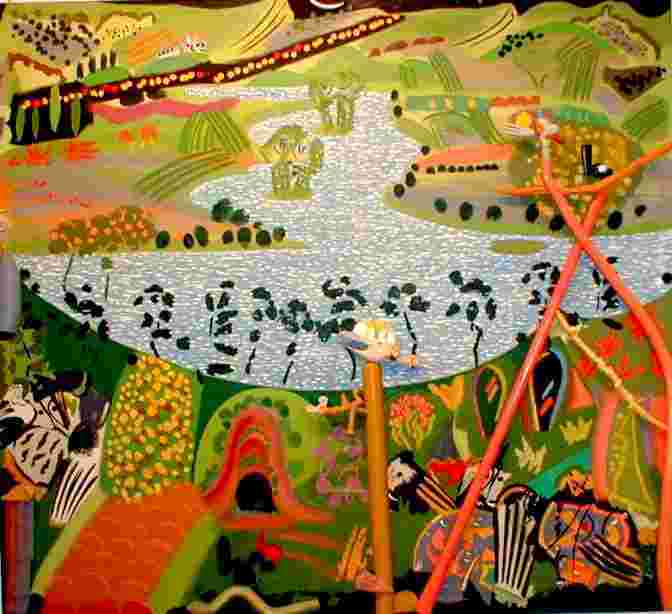 During 2014 Lanceley was commissioned by the Wollongong City Gallery to produce an Illawarra-themed work. 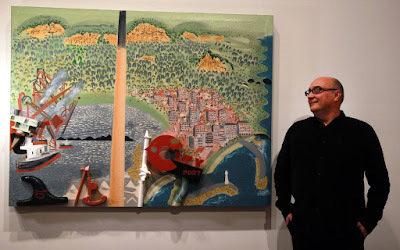 The resultant relief painting incorporates a coastal view looking north from Port Kembla towards the national park, with a view of the smelter stack and the city of Wollongong. It is possibly his last major work, as the artist died on 30 January 2015 at the age of 77. This was just 7 months after delivering the work to the gallery. The following is a list of known works by Colin Lanceley featuring the Illawarra and South Coast of New South Wales, Australia. The listing is arranged into two groups - the first focuses on northern Illawarra around Wombara and later to the south near Port Kembla and Wollongong, whilst the second group relates to Werri Lagoon near Gerringong. Both are arranged chronologically within those groups, and images (where available) follow descriptions. Oils on carved wood and canvas, 160 x 214 cm. Private Collection, Sydney. Formerly on extended loan to Wollongong City Gallery. Illustrated Craftsman House, figure 23, b/w. Acrylic pastel on paper. 40 x 50 cm. Private collection. No image available. Ink and pastel on paper. 40 x 50 cm. Signed CL '87. 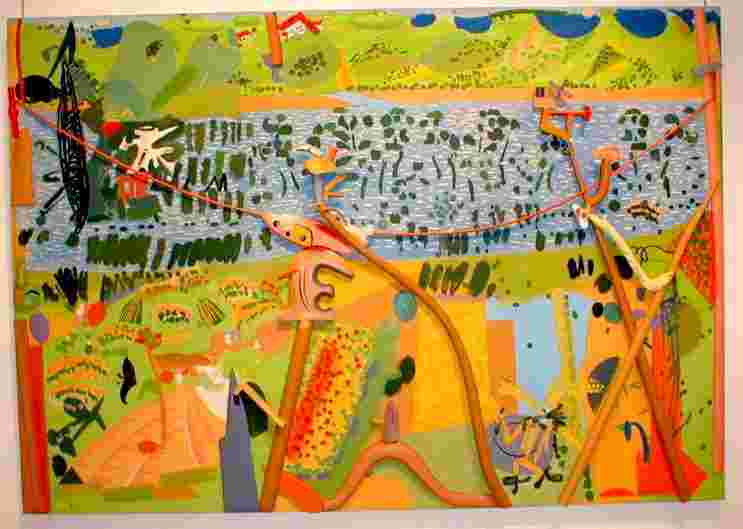 Sold at Christies, Sydney, 25 November 2002; Shapiro Art and Design, Sydney - Modern & Contemporary Art Sale No.20, 22 May 2006, $1500 Aus. No images available. Collection: Michael and Michelle Magnus, Sydney. Illustrated Craftsman House, plate 38, colour. 6. Coalcliff Mine with Portrait of D.H.L. Chalk, pastel and gouache on paper. 71 x 105 cm. Collection: Auckland Art Gallery, New Zealand. Lithograph, printed in five colours from stones or plates on paper. 58 x 76 cm. Edition of 65. Watercolour and pastel on paper. 58 x 77 cm. Lithograph, printed in colours from stones or plates on paper. 80 x 100 cm. Collection of artist and formerly on loan to Wollongong City Gallery. Illustrated Craftsman House, plate 48, colour. Pen and brush and black ink, pastel, watercolour, crayon, coloured pencil, collage on ivory wove paper. 107 x 175 cm. Collection: Art Gallery of New South Wales. Indian ink, coloured pencil and crayon on Arches paper. 80 x 100 cm. Signed and dated: l.r.c., “Lanceley 97”. 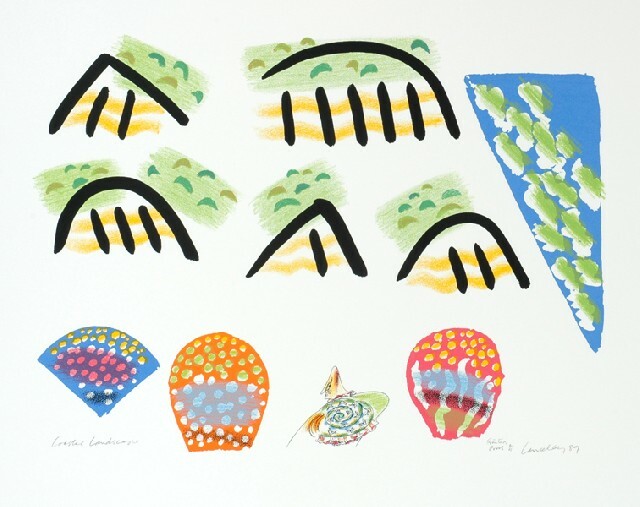 Collection: Wollongong Art Gallery, purchased 2000. Indian ink, coloured pencil and crayon on Arches paper. 67 x 101 cm. Signed, title d and dated: C Lanceley -2003, bottom right corner 'steel Harbour' blc. Collection: Wollongong Art Gallery, purchased 2003. Oils on carved wood and canvas, 127 x 169 cm. Collection: Wollongong City Gallery. Commissioned 2014. Oils on carved wood and canvas. 155 x 178 cm. Oils on carved wood and canvas. 171 x 179 cm. 184 x 263 cm. Source: Charles Nordrum Gallery, London, $60000. Oils on carved wood and canvas. 179 x 197 cm. Pen, ink and watercolour on paper. 56 x 76 cm. Oils on carved wood and canvas. 184 x 263 cm. 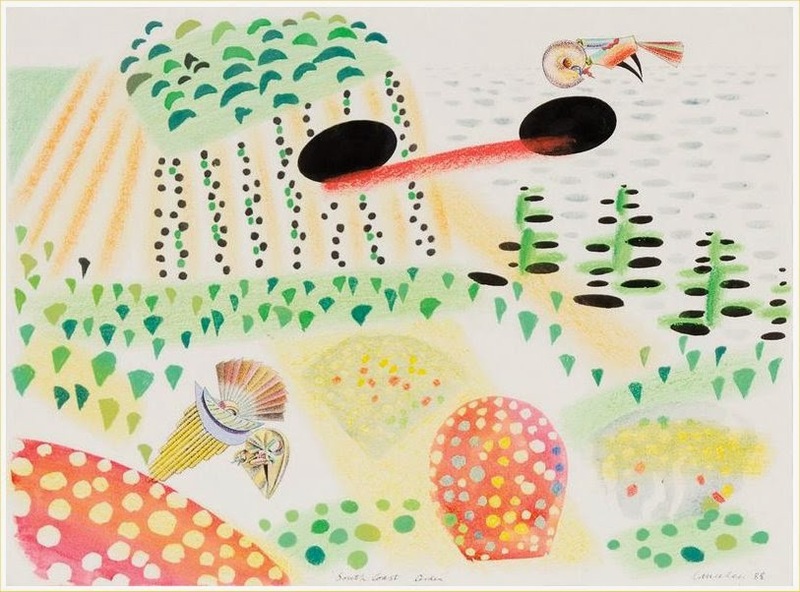 Source: Charles Nordrum Gallery, London, $75000. Colin Lanceley, Craftsman House, Sydney, 1993, 156p. With an Introduction by Robert Hughes and interview with the artist by William Wright. France, Christine, Illawarra and Environs [exhibition catalogue], Wollongong City Gallery, 1988. Hawley, Janet, Encounters with Australian Artists, University of Queensland Press, 1993. Wachsmuth, Lisa, Colin Lanceley's legacy a record of the Illawarra, Illawarra Mercury, 15 January 2015. URL: http://www.illawarramercury.com.au/story/2854281/lanceleys-legacy-piece-depicts-the-illawarra/.